My last holiday was a ‘mer à boire’ for a foody like me. Everywhere you go in Italy and Provence you see something worth exploring. Even supermarkets are interesting abroad. In the shop we met Madam Anne Daguin and she very kindly let us take a look in the bakery. There the ‘triangles aux amandes de Provence’ were just being made. They are among our favorites, together with the ‘désiré’ with almonds an vanilla. At the moment I am attempting to read the book, which is in French. And of course I am going to try the recipes. I will keep you posted! When I saw this little book in a tin on the counter, about this place and it’s recipes, I just had to have it. Anne, also the author of the book, wrote a lovely message in it, which made it even more special. With cookies and book (nr. 356) I left the store, feeling like a spoilt child. With the book and the cookies in the tin you can’t go wrong. The cookies are really special and delicate. It’s great to try them and see what your favoriete is and then trying the recipe from the book yourself. The content of the book is a little bit different so to speak. It’s texts and little drawings, recipes, funny stories, history. If you have been to the place, you see and feel that it fits. It’s a unique little book, also the look and feel of it, with the original cookie tin casing. My French is not good enough to truly understand the exact meaning of everything. The recipes are very clear though. But it’s so different from all the other books I own. Looking at it and reminiscing is also fun. So getting this little gem and /or a tin of the cookies as a gift is truly special I think. I have the Jam book in English. It’s great for inspiration. I would never have come up with so many different ideas and varieties of confiture. can you tell me more about the book and it contents? As I have a friend who lives nearby St. Remy, and who always asks me what to bring for me next time he comes to Holland, maybe this is an idea!? Soon he will bring Mme Ferber’s Jam book, how about that! I am sorry to tell you that I do not have the recipe and I do not know these cookies. You could ask/ mail Madam Daguin from Le petit Duc in St Remy maybe. Succes and if you find anything I would love to know! 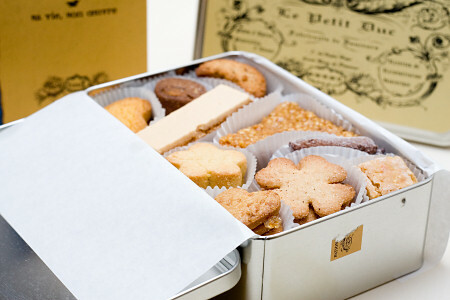 i just want to know if you have the recipe for coeur de linz cookies, if you have please let me know. thank you.